The paper is based on a survey of 1,200 people in six countries and illustrates key results in 18 graphs and charts. It also compares attitudes and beliefs in the different markets surveyed. The paper begins by outlining the most commonly identified general trends for the future of mobile before looking in more detail at the specific benefits that young adult consumers believe hyper-connectivity will bring to urban living, transport, health, time management and mobile payments by 2025. It then continues by examining respondents’ predictions for the impact of possible future technologies on the workplace and on attitudes towards security. The paper concludes by providing an industry perspective on the overall findings of the survey and by identifying the challenges and opportunities presented to business by ongoing mobile innovation. 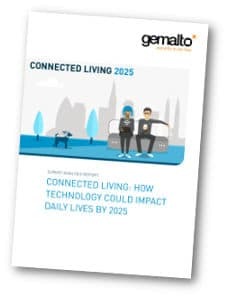 This paper has been produced and sponsored by Gemalto and has been approved by the NFC World+ editorial team. This 25-page document is available free of charge to NFC World+ Knowledge Centre members (PDF format, 1.8MB).